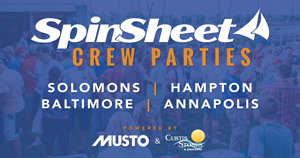 If you plan on attending the SpinSheet Annapolis Crew Party at Eastport Yacht Club on Sunday, April 30----yes, THIS upcoming Sunday!---here are some reminders. The party runs from 4 p.m. to 6 p.m. in the waterfront parking lot. We're sailors, so we party rain or shine OUTSIDE. Dress accordingly. The party is open to the public and to sailors of all levels. There's a cash bar – that means no credit cards. There will be live music, as always, by the Geckos. Bring notebook, pen, and smart phone to jot down contacts of skippers or crew. Do NOT park in the EYC parking lot. There's plenty of parking on the street within a few blocks. Go go the Spring Sailboat Show first--it's a great way to spend the day. If you do go to the Show first, take the Water Taxi to the Chart House nearby and walk to EYC. If you want to win some MUSTO Gear, sign up here online. We will announce winners for sailing shoes and a jacket at the party. Questions? Email [email protected]. See ya there!